Redesign the toothbrush: A former student of New York’s School of Visual Arts, Leen Sadder, looked to the roots of oral hygiene to complete the task set by her professor. During her research she came across the benefits of the Miswak stick, a tooth-cleaning twig traditionally used mainly in the Middle East, Pakistan and India. With each use, the top is bitten off to reveal soft bristles similar to that of a toothbrush. The twig is made from the Salvadora persica tree. “I thought to myself, ‘you know what, you're in grad school. You’re allowed to do crazy things like this,’ and went ahead with the stick idea,” Leen told the Al-Bawaba news outlet in an interview. Sadder began her student project, revamping the Miswak stick with the aim of marketing it to a modern, western audience. The biggest challenge, states the website for “the dieline Package Design conference” held in San Francisco, was figuring out how to advertise the stick to a contemporary audience, not used to the idea of biting the end of a stick to brush their teeth. The “THIS” team, which has grown to involve a few more individuals according to their Facebook page, came up with a solution based on a cigar cutter, and included a “stick cutter” in the product’s packaging. As well as clinical, sleek packaging, a campaign was designed to promote “THIS” as a viable alternative to the toothbrush for the contemporary market. 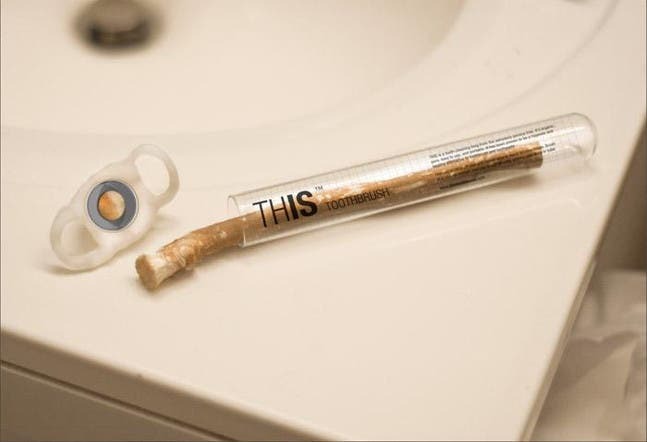 A series of posters and print ads were designed depicting photographs of sticks in nature compared to photos of the Miswak stick in a clean bathroom, with the phrases “This is a stick,” and “This is a toothbrush,” superimposed respectively. The product has not been mass produced yet and is still in the design phase, according to their promotional Facebook page. The World Health Organization (WHO) recommended the use of the Miswak stick in 1986. In 2000, an international consensus report on oral hygiene concluded that further research was needed to document the effect of the natural product.